Janet Endsley is the Seminar and Social Media manager for the Northwest Flower & Garden Show…. Collectively, we gardeners possess certain personality traits that help us weather the trials and tribulations of our passion. 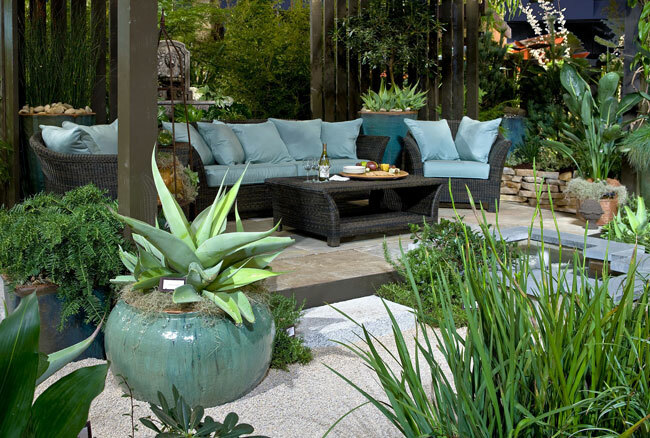 Whether we’re planting trees, painting a landscape with foliage and flowers, hitting all the plant sales, or optimistically planning a garden wedding, passionate gardeners rely on their planning skills, creativity, an impulsive streak, and blind faith. Duane Kelly, founder of the Northwest Flower & Garden Show, possessed all these traits along with the courage to mortgage his house and assume enormous risk. After visiting the 1987 Philadelphia Flower Show, Kelly predicted the Northwest would be fertile ground for a similar show. His wife, Alice, had a different kind of blind faith: complete belief in her husband’s ability to orchestrate such a major production. After two years of intense preparation, the first Northwest Flower & Garden Show opened in 1989 to lines stretching down Pike Street. “We were thrilled when we saw how many people showed up,” Kelly said, “but after ten minutes we panicked, realizing we had no idea how to handle such large crowds.” Since that morning, the show has become a highly anticipated annual event drawing gardeners from around the United States and Canada. And the family enterprise, which grew to include children Celice and Cyle, went on to solve countless logistical problems. While each show only lasts five days, its impact has had a profound and lasting influence on Northwest gardeners. A theater aficionado, Kelly recognized how a garden show was akin to a theater experience that simultaneously delights, confounds, inspires, and entertains. Display gardens are built, vendors and celebrities descend for a few fleeting days, eager gardeners flock to attend, and then—like the most perfect flower—it is gone. From the beginning, the Northwest Flower & Garden Show set out to be different from its predecessors in Philadelphia and London. Duane called it his “three-legged stool” composed of inspirational show gardens; a tempting garden marketplace; and a seminar program second to none and free to all attendees. It’s a successful formula that catapulted the show to become the second largest garden show in the country and a true gardener’s garden show. In yet another leap of faith, in 2009 Kelly announced he was selling the show to pursue playwriting full time. The gardening community feared their February floral fix would disappear but rejoiced when another family-owned business, Portland-based O’Loughlin Trade Shows, acquired the show. Since then, producer Terry O’Loughlin has been a careful steward, honoring traditions, enhancing the show experience, and working to captivate the next generation of gardeners. For this year’s silver anniversary celebration, gardeners can expect a nostalgic return to the blooming splendor of the earliest show gardens alongside a showcase of current garden trends. Whether you’re a well-seasoned gardener who fondly recalls the very first show, or you are planning your inaugural visit, you’ll find yourself immersed in an experience that captivates your imagination, tugs at your desires, replenishes your senses, and connects you to the soil. But remember, like the delicate blossoms of Galanthus nivalis, after February 24, 2013, it’s all over again—until next year.